The first foal of the legendary Frankel made a winning racecourse debut at Newbury on Friday. Cunco, sired by Frankel out of multiple group race-winning mare Chrysanthemum, won the Welcome To The Starlight Raceday Maiden Stakes. Born in January 2014 and trained by John Gosden, Cunco came home three-quarters of a length clear of Isomer. Frankel won all 14 of his starts, earning almost £3m in prize money, before being retired to stud in 2012. Trained by Sir Henry Cecil, he was at one point the highest-ranked racehorse in the world, twice claiming world champion honours. 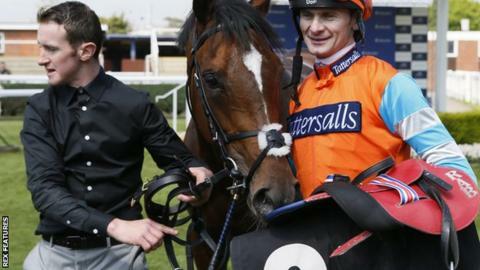 He finished his career with a victory in the Champions Stakes at Ascot in October 2012. "This historic success was achieved in magnificent style. "Cunco (who has a distinct look of Dad) seemed to be up against it; he was what we euphemistically call coltish beforehand (a young male sensing female horses perhaps) and his mind didn't seem on the task in hand for the early part of the race. But when Havlin urged him to get on with it he was terrific. "Not all good racehorses are fine stallions, so there were plenty of nerves about this, but it turned out to be as great a start to Frankel's stallion career as anyone could have hoped for." Read more on Frankel: What lies in store for the retired £100m wonder horse?